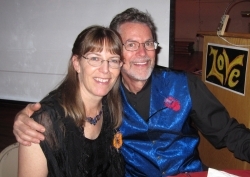 Chris and Sandy, married 40 years, 2010. Why do we work with titanium? Because we’re nuts! And, after so many years of specializing in the reactive metals, we continue to “think” in titanium and niobium. We’ve been making jewelry since 1969. From 1975 through 1981, Chris and a former partner owned and operated The Wedding Ring Store in Washington, D. C. In 1978, they became captivated by the unique qualities of titanium and produced their first titanium earring designs. We, Chris and Sandy, then went on to add many additional jewelry designs in titanium and niobium. In 1991, Chris combined his years of goldsmithing with his passion for titanium to produce the beautiful rings you see here. We have been online since 1995, and TitaniumRingsForever.com has been our Internet home since 1998. We are committed to fulfilling our customers’ expectations for a perfect fit and top quality titanium wedding ring. We are jewelers first and last, not machinists, bicycle repairmen, or middlemen. Our long experience results in parts that fit, tolerances that are close, finishes that are even, textures that are consistent, and a ring that fits. We can make any size in the tiniest increments. We guarantee that your ring will fit you. We mill our rings from solid titanium which is much stronger than a cast ring and allows us to adjust the ring size if necessary. Occasionally a customer needs an adjustment up or down in size and we are happy to do this at no additional cost during the first year. We work in pure titanium rather than its alloys and, depending on the style, with inserts of pure niobium, various karats of gold, platinum, and gemstones. All of our styles can be altered as to width, thickness, inlay type, et cetera — whatever you want. If you’re thinking of something completely different, contact us with your ideas. 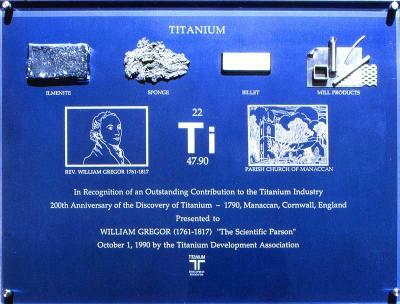 In 1991, we were chosen to make the plaque for the 200th anniversary of the discovery of titanium by William Gregor. Commissioned by the Titanium Development Association (now the International Titanium Association), it was presented to the church in Cornwall, England, where Gregor was pastor when he first separated the element titanium from the mineral ilmenite in 1791. So far we have made rings for people who worked on the SR71 and titanium submarines. We would be honored to make one for you. Browse our titanium wedding ring catalog and send us your ideas for your own custom titanium wedding ring!